A collaboration of brainiacs from the MRC's Regenerative Medicine Centre and Cambridge University's Veterinary School reversed the paralysis after injecting them with cells grown from the lining of their noses. They're "cautiously optimistic the technique could eventually have a role in the treatment of human patients." Wow. Thankfully, they didn't go around breaking wiener dogs' backs to try and put them back together again — instead they focused on 34 pet dogs who were already paralyzed. 23 of the dogs had the cells transplanted into the injury site and the rest were injected with a placebo of neutral fluid. Many of the dogs that received the transplant showed considerable improvement and were able to walk on a treadmill with the support of a harness. None of the control group regained use of its back legs. Professor Robin Franklin, a regeneration biologist at the Wellcome Trust-MRC Stem Cell Institute and report co-author, said: 'Our findings are extremely exciting because they show for the first time that transplanting these types of cell into a severely damaged spinal cord can bring about significant improvement. The owner of Jasper, a 10-year-old dachshund test subject, told the BBC: "Before the treatment we used to have to wheel Jasper round on a trolley because his back legs were useless. Now he whizzes around the house and garden and is able to keep up with the other dogs. It's wonderful." Yay, Jasper, you whiz around that house and garden, you little dynamo! The researchers say, "the transplanted cells regenerated nerve fibres across the damaged region of the spinal cord. 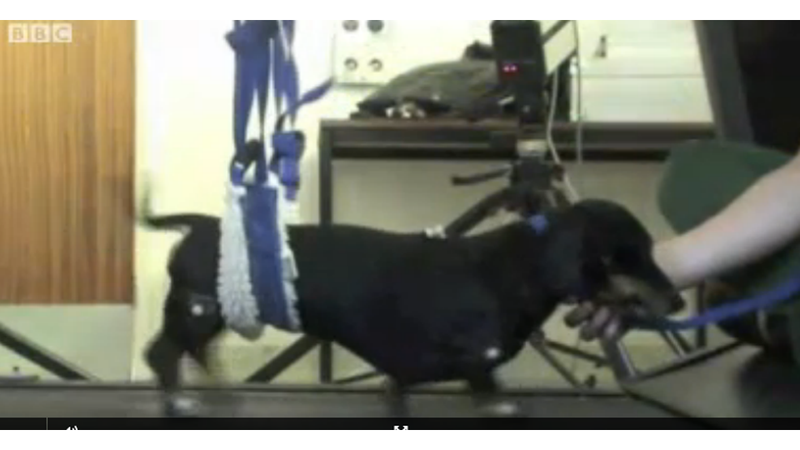 This enabled the dogs to regain the use of their back legs and coordinate movement with their front limbs." They believe the best results might come from a combination of the procedure and drug treatment. While they warn that this isn't a cure for spinal cord injury in humans — and that might be long time coming — it's still hopeful as, "this is the most encouraging advance for some years and is a significant step on the road towards it." Go, Jasper, go! Go, Science, go!